Dota 2’s playerbase has been effectively capped during its beta, though you wouldn’t know it. Beta invites were being piled up in the streets of Steam, it seemed, ready to be fashioned into pyramids by the children of the Weimar Republic. Yet now the game’s being officially released, it’s welcomed a flood of new players into its already-busy lanes. 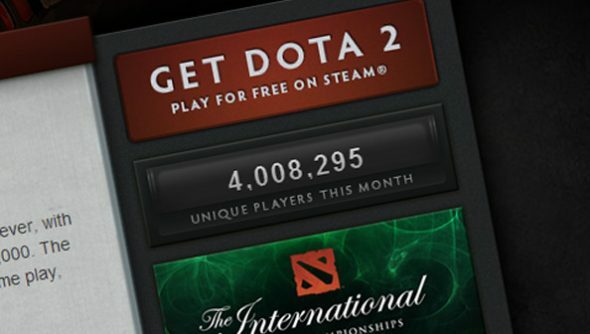 By the end of its two year beta, Dota 2 boasted a three million strong monthly community. It’s hosted over 4,008,000 unique players this month, however, and we’re only halfway through. The news takes on an especially bewildering quality when you take into account the sluicegate-like system Valve are currently operating – slowly allowing a trickle of new players into the game so’s not to interrupt service for the existing beta community. Dota 2’s record-smashing popularity is proved every single day on Steam stats. There you can see that 334,000 Steam users were running Dota 2 at its peak today, trumping by nearly four times the playerbase of its nearest competitor, Team Fortress 2. And even then, it continues to trail behind League of Legends, Riot’s rival MOBA. There’s no point in denying it: the MOBA is here to stay. We live in a PC gaming sphere where tastes and habits have been changed irrecoverably by concepts like jungling and juking. What do you lot think about that? Is that something to celebrate or lament?